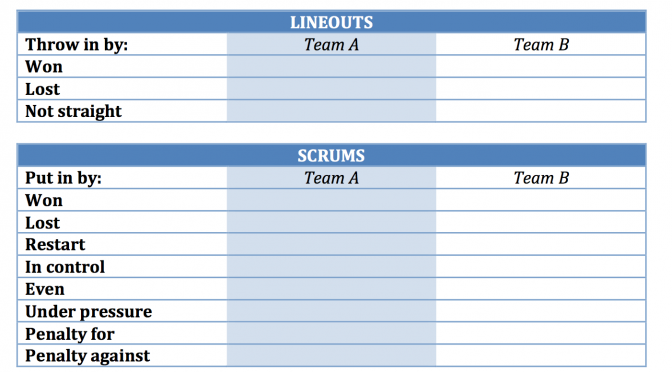 where Team A and Team B are representing the team that puts the ball into the scrum. Then you can just count how many scrums there where during the match, how many your team won cleanly, won under pressure or lost. You also get how many times you were able to put pressure on the opponents, even if they won the scrum in the end. With this data you can quickly evaluate scrum efficiency on a basic level and talk to coaches about why the numbers look they way they do. It really doesn’t get any simpler than this, does it? Below I’ve attached a link to a file with some basic tables for frequency counting in it. Just to get you started. Feel free to download it and change it in any way you like. Simple Frequency Form (Word-format .docx 221 kB) In it you’ll find a couple of pictures of a rugby pitch, or parts of it. You can use these to plot where you and your opponent scored tries and where on the pitch penalties were awarded. Good luck and please share any improvements, or suggestions of such, you might have in the comments below. Previous PostWhat’s with the name? thePAguy.com?Next PostVideoanalys – Varför då?